Thanks to UNB Libraries, first-year students at the University of New Brunswick (Fredericton) in the faculties of arts, science, nursing and Renaissance College have one more thing in common. 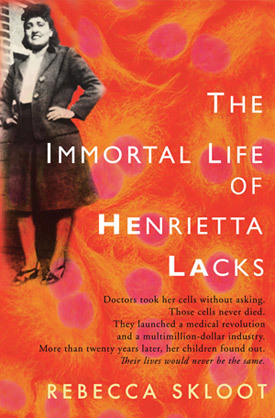 This summer, UNB Libraries is providing close to 600 first year students with a gift copy of the award winning book, “The Immortal Life of Henrietta Lacks” by Rebecca Skloot. The book explores values, ethics, cultural diversity, history and science, as it describes the incredible impact that one woman continues to have on our society. Students are encouraged to read the book during the summer and engage in online contests and discussions which will enable them to connect with other first-year students and faculty even before classes begin. During Orientation week, all first year students participating in UNB Common Read will take part in curricular and co-curricular activities based on themes in the book. This includes the showing of the BBC documentary, “Cancer Cell Research: The Way of All Flesh”, which is based on the story of Henrietta Lacks. This will be followed by an ice cream social that will bring together first year students from the four participating faculties. Professors are encouraged to integrate the book into their curriculum, allowing for a specialized discussion of the book, applicable to their course. Other co-curricular activities are also being organized for the fall term. “At UNB Libraries, we believe that promoting reading and cross discipline discussions will not only help build a stronger UNB community, but will also help students make an easier transition to university,” said Judy MacLean, Science and Forestry Librarian, and Coordinator of UNB Common Read. “By providing first-year students with a common reading experience, we can help facilitate discussions with peers and faculty which will develop critical thinking skills as students learn from one another and encounter differing points of view,” said MacLean. Participation has nearly tripled since UNB Common Read was first piloted last year in two faculties. “I am really encouraged by the support of our university, our faculties and our students. UNB is one of only a few Canadian universities taking part in this kind of a first year experience program. Our goal is to make UNB Common Read a campus wide initiative so that all first year students can benefit,” said MacLean. For more information, check out UNB Libraries’ Guide to Common Read, like UNB Common Read on Facebook or follow on Twitter @UNBCommonRead.